Robbie Neilson believes a home fixture against Scottish Premiership leaders Aberdeen is the perfect game to arrest Hearts' dip in form. 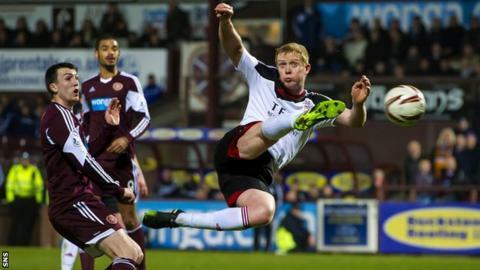 Hearts have suffered back-to-back defeats for the first time since Neilson took charge in May 2014. Hamilton Academical ended a run of five straight wins for Neilson's side, who subsequently lost to Inverness Caledonian Thistle. "It's a great game to come back into," said Neilson of Sunday's match. "We need to deal with it. Aberdeen are absolutely flying. They have had a great start to the season and it will be a full house on Sunday so you couldn't ask for a better game to try and put our poor run to bed." Neilson has not been surprised that Aberdeen have been on such good form, with Derek McInnes's Dons having won their opening seven league games. "I think they have just carried on from last season," Neilson said. "I think having the Europa League games at the start definitely helped them. "Having six competitive games before everyone else starts and we are playing catch-up a little bit. They are a good squad with a good manager and a good club who are really pushing on in the league." And Neilson says being back in familiar surroundings at Tynecastle should help his players after the recent away defeats. "It's a big difference playing at home for our players," he explained. "Totally different atmosphere, we are used to playing in front of 17,000-18,000. We go away to some grounds and it's only 1,500-2,000. "It's hard for them and they need to learn how to handle that. I think they are still doing that. I don't have any issues about Sunday. They will be ready for it." Hearts, who won last season's Championship, have an excellent recent record against Aberdeen with just one defeat in their last 14 meetings, including eight wins. Neilson is keen to ensure that record continues. "Tynecastle is a difficult place to come to," he added. "We haven't lost a lot of games in my time here and hopefully we can carry that on."